Bout of Books 8.0 SIGN UP! 1. Post on your site and declare your intentions to join us. It's EASY. Grab the official blurb (below) and our button (in the sidebar) and create a post. 2. Add your link to the linky in this post. 3. There will be an OPTIONAL Social Hour sign up beginning on August 5th. Check back on that date for more details. 4. On August 19th, READ! We're doing experts a little differently this year. Bout of Books is GROWING, y'all. And as it grows, we're limited as to how many people we can reach and interact with. This time, Bout of Books experts will be given extra superpowers. We're splitting experts into two groups: comments and Twitter. 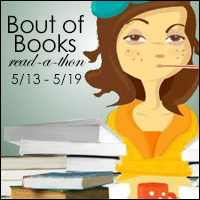 If you're a comment expert, you get to visit #boutofbooks-ers' blogs and comment on their posts--tell them how awesome they are and how well they're doing. If you're a Twitter expert, you get to help us around Twitter by answering questions and, GET THIS, hosting a social hour during the evening announcements (Tuesday 8/20 through Saturday 8/24 only). Fill out this form below to sign up to be an expert! We need TEN people total (five for each group). You can sign up to be both, but you will only be chosen for ONE group. Please note: if you sign up for Twitter, you are required to be available between 7:30CST and 8:30CST on at least one day from Tuesday to Saturday. We will be closing this form on July 31st. If you're interested in helping us, make sure you get on our list before then! Challenge sign up will close July 28th at 11:59pm CST. Preference will be given to challenges that are NOT genre specific. You will be turned down or asked to change your challenge so that it is not genre specific. We want to include EVERYONE.